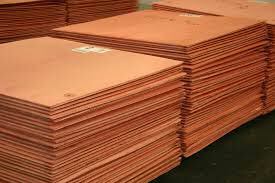 Our company offers a wide assortment of Copper Cathodes. Ductile as well as thermally & electrically conductive, the Copper Cathodes are used in the production of superior quality copper ingots and tubes and many other extruded copper items for engineering, construction, electronic and railway industry. We offer dimensionally precise as well as corrosion & friction resistant Copper Cathodes in customized specifications at the market leading prices.